SOSCuisine.com compiles, compares and analyzes all the flyer specials and coupons from supermarkets across Canada in order to track down great bargains for you. So you’ll know what to buy and which of your favorite supermarkets to buy it from. Say goodbye to going through flyers with a fine-toothed comb! Reduce your grocery bill with just a few clicks. SOSCuisine has access to flyers from all the major supermarket chains in Canada. 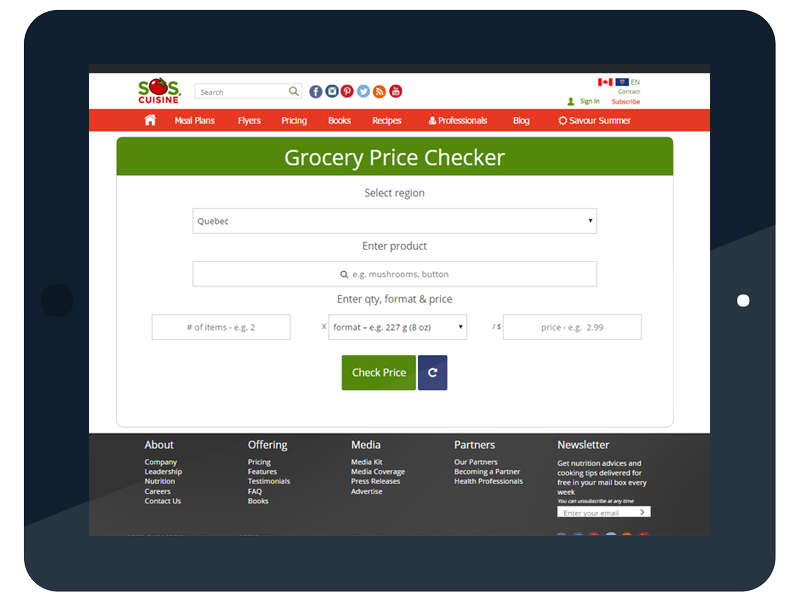 SOSCuisine.com also takes into account small local grocery stores such as Jardin Mobile (in Quebec city) and Marché Adonis (in Montreal). Each week, we collate all the current specials in a table and analyze them to show you which are the real bargains. All prices are compared on a uniform basis (per kilogram or liter)..
For each item, the best price for the week is identified. The real bargains are highlighted. What is a real bargain? It is a really great price compared to the regular price. Since launching the site, SOSCuisine has accumulated millions of “specials” offered by various brands. That allows us to compare each special with the regular price and tell you if it is a lower price or simply a marketing ruse. Thanks to SOSCuisine, both consumers and their wallets are finally getting the most out of these flyers! 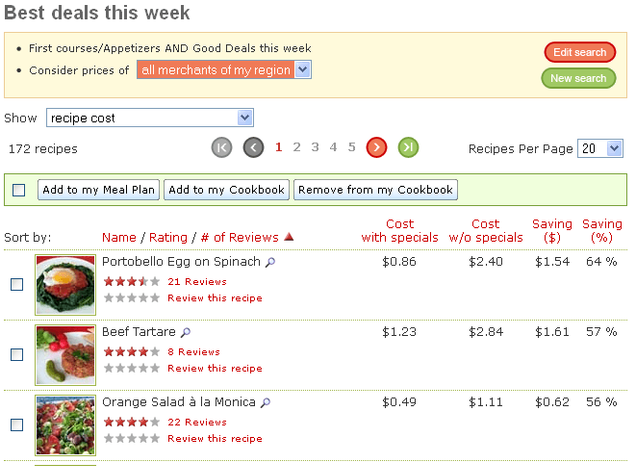 Each week, you get to discover the most cost-effective recipes. These bargain recipes are the ones that use the most number of ingredients that are on “special” offer during a particular week. Your can save up to 80%! Find out whether or not that price really is a deal. Simply enter your product, the quantity, and the price then hit “Check Price” to know whether or not you’re getting the best bargain. The table for comparing flyer specials is connected to your grocery list. 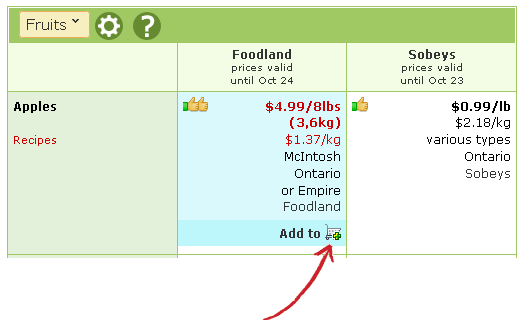 You can automatically add all the specials you want to your list. Avoid calculations and unpleasant surprises at the checkout, SOSCuisine calculates the total cost of your groceries for you. SOSCuisine allows you choose only the grocery stores that interest you, for scenarios that truly match your requirements. Maximum number of specials: Enjoy the largest number of items on “special” offer and maximize the amount of money saved from the regular cost. Minimum cost: Enjoy the lowest total cost. 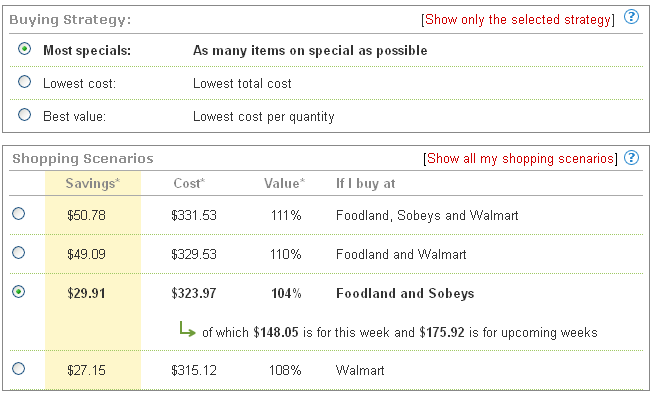 Value: Maximize the value of the purchased items, i.e., to maximize the amount per dollar paid. Shopping scenarios: SOSCuisine identifies for you THE best purchase scenario, i.e., the best combination between the specials from your favorite stores, the ingredients you need and the purchase strategy you have chosen. For each scenario, we indicate the savings and the cost.